Math-rock we all know about. Flannel-shirted, speccy blokes with barberphobia and protractors protruding from blue jean back pockets. Hard, studiously abrasive, paradoxically guaranteed to veer off at unlikely times and in unlikely directions. If an adjective of temperature had to be applied to this trigonometric diversion, it would be cold. So, even those of us who think EU is somewhere in Brussels can hazard a guess that Warm Math, the latest long player from EU, is not math rock. And it isn't. EU, for those amongst us who think EU is somewhere in Brussels are Sasha Zaitsev and Ilya Baramiya. Two Russians creating uncalculated music electronically but, as far as they are concerned, two people making music to touch other people. 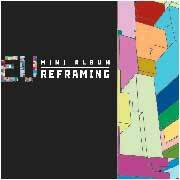 Their debut album, Reframing, was released on Bristol's Pause 2 label a couple of years ago. It sounded like an elderly hard drive sliding gently into senility. Glitches and burps and mis-beats curling around a disintegrating core, still trying to function, to produce its pure data tones, but slowly failing. Not so far removed from the same beauty/beats disjunction of Magnetophone, but never as fierce. Now, after a flurry of singles, compilations and collaborations across a stack of labels, Warm Math has arrived and the EU sound has mellowed and broadened. Warm Math is a clutch of songs without words. Still produced on computers, and still only capable of being played on computers, it is concerned less with the mechanics of its own construction and more with the emotion involved in its creation. But before we talked about it or them, I needed to know something. I saw a documentary a long time ago about dance music in Russia and it had DJs using reel-to-reel tape instead of vinyl. Is it true? S: Maybe it was, but I've never seen it. I: I saw it in a University in the beginning of the 90s. The DJ lives in Moscow now and he was playing on the campus outside the city using big tapes and a mixer. So you never did any of that? S: We never DJ'ed at all. Are you not interested in it? It's an easy way out at gigs. S: It's different from making music. You know in Russia they only like DJ if they play danceable stuff and I'm not very interested in 4-4. I: There are maybe two DJs who play anything like interesting music and it's not really interesting for me to play the other stuff. When you got together, how easy was it to get the music that you've said influenced you, people like Aphex and the Warp label? S: It was changing from time to time and we were not always listening to electronic music. We met each other changing CDs and tapes of any kind of music. It was King Crimson and Nick Cave and Coil and different kinds of music. Not only electronic. I: Mostly tapes, so it was pretty hard to find out the records and usually it was delaying for a year. So you could find the album of the person released the year before. But, for us, it's different now. It's still not really available, the stuff we're listening to in Russia, but it's not such a big problem to find music in Russia now. Is that because vinyl is more widely available now or do you go to the internet to get it? S: No, there is special vinyl shops for DJs and I think we can find almost anything in Russia now. Maybe not everything like it's very hard to find any musique concrete or stuff from the fifties, but everything else..
Has the internet made a big difference to what you've been able to do? S: We try to always use it. But there is a lot of interaction with lots of people and it's not good. Instead of producing music you start chatting with them and sending emails. I: But it's a very important part actually. Because we can work with people a big distance away. We found Tom [of Pause 2] contact us through the internet. He found our tracks and emailed us. We discussed all stuff by email. S: It helped us a lot because we just downloaded our tracks on MP3.com and it worked. I: We can reach any information without any delay. It's so universal isn't it? Do you think that the kind of music that you make has no boundaries? Rock'n'roll was American, but electronic music is international. S: That's exactly the way I feel about it. It's really hard for a Russian rock band to get any interest outside of Russia because of language..
S: You can produce electronic music anywhere. It's universal. Yeah, so it can appeal to, and influence, a wide audience. S: Recently we realised that perhaps we're more influenced by Russian soundtracks from the 60s, 70s than modern electronica because it's very hard to realise. It works when you're very young and you can't realise it. You've just seen some movies and that's all. It's very easy to think "I like that CD and it's influenced me." Could that be why your style is changing - you were trying to do something in the beginning and now you're just letting what's inside come out? S: Maybe. Our name in Russian is like Christmas Baubles, which is another reference from childhood like celebrating New Year is the best holidays for children. It's not an exact term because we don't mean Christmas we mean New Year. These are the things that decorate elm trees for New Year. I don't know the exact English term for it. There isn't one. Have you got lots of little baubles to hang around you on the stage? S: It was a funny story. The first year we were recording in a professional studio we took with us some baubles, trying to get from them any sound. But they just doesn't sound. When you record it, it's just crap. When you started making music, what equipment did you have? Just a PC? S: Yes, we have a PC and small, little by little.. I: ..our friends shared with us their equipment. Someone gave a mixing desk to borrow us for a while, a synth and stuff like that. Did you learn how to use the equipment just by using it? S: No, we just used it. I think it led to an intuitive approach for music because I met a lot of people who learned music making for years and after that they don't know what to do. It's got to be on a page for them. When you make music, do you go to the computer with a melody or a sound or a beat in your head and make it? S: We just turn on and start to do something. Usually Ilya produce some bass drum loops and I try to make some melodies or arrangements and then Ilya adds some more sounds and I arrange it again. Has the way you make music changed since you started? S: We haven't really changed because learnt other things. We learned that music is about feelings and emotions than messing around with software. We tried to keep distance from modern dance music because I don't like it. It's people just using software and spending a couple of hours in front of the computer making something that's just music. And no-one wants to listen to it twice. I find it stupid. I don't like this approach. Hopefully we escape this. The new album feels like an album. It feels like a coherent set of songs. It feels almost like a band could play it. Well, some of it. S: I think I was trying to do that on this album. I don't like just playing the loop and changing some parameters. I think listening to that you get tired very soon. We were trying to make it [Warm Math] sound like a proper piece of music with proper arrangements, with choruses and verses and such. Do you think of it as chorus and verse even when there's no vocals? S: We like to use vocals but we haven't got any good experience with vocalists. We even produced an album for Russian female singer. It was released in Japan and it was terrible. So we are very careful about involving someone else into our work. On the Christmas Baubles project we worked with friend of ours and we really understand each other. At the same time, we were trying to work with a nine-piece orchestra in Russia. They all came from classical background and now they're trying to mix baroque with classical and folk. We were asked to produce some tracks for them and we were trying but we weren't able to do what we wanted to do. So we've had to split up. We still use some vocal samples. There's a very good friend of ours, Rosa, who sang for us some years ago and then disappeared. But I still use samples of her voice. It was on our Reframing album. The single Wienn contains samples of her voice. And some tracks we haven't released yet. We still like to work with other people. We are working with Cursor Miner. We invited him to Russia to play some shows with him singing on top of our tracks and we playing on top of his. It was very interesting experience and we would like to do more. We discussed some things with Stoloff and Hopkinson [also on Pause 2] and I would like to produce some tracks for them. We always have a lot of things planned. Are you very well known in Russia? There was a period when a lot of Russian bands, well a few Russian bands, and the Lo compilation that you curated..
S: ..there's a second edition of that coming out soon..
..do you feel part of something happening at the moment? S: There's a lot of things happening inside electronic music. We helped a friend of ours to build up a record label, Cheburec, and he let us to release some stuff. Not exactly us, we just help him some CDs and some compilations and events. We hope we can afford later to invite more people from Britain to come and play in Russia. When you play live, how much do you play and how much is on tape? S: We are just now in the middle of the way. We just spent the last year working out how to play live. We have a lot of stuff that's not fixed in the studio yet. We played them only live and so they are fluid. They change. They depend on the audience. Some tracks from album they have more strong arrangements so some of it is played from audio sequencer and Ilya effects it in real time and I play on top of it. But now our main task is finding a way for electronic bands to play live properly, not relying on playbacks. It that important to you? Does it make any difference? S: Yes. Because sometimes we have produced tracks and we didn't know what to do on stage. We just stand in front of computers. It looked stupid and we feel stupid. We were trying to write some tracks for live shows. We realised how great it was to be on stage and play for people, to feel the interaction between the audience and us. It's very important, I think. It's so easy to just stand behind a laptop and press "go." Do you think it's too easy to make music these days? I: No, I think it's very good that there is a possibility to make a CD. Anyone can put out a CDR.. I: Ha ha! That was the aim, to have a CD so that people can reach us. Nothing changes in the way of spreading music - people who want it buy it and people who don't want to buy it don't buy it. When people had to duplicate demos by hand in real time you really needed to care about your music to go the effort. Now you can make a track and burn it onto the CD in five minutes. S: Because of that, a lot of crap appears. But anyway, the whole thing works as before. The good stuff is picked up.. I: ..and crap is crap.